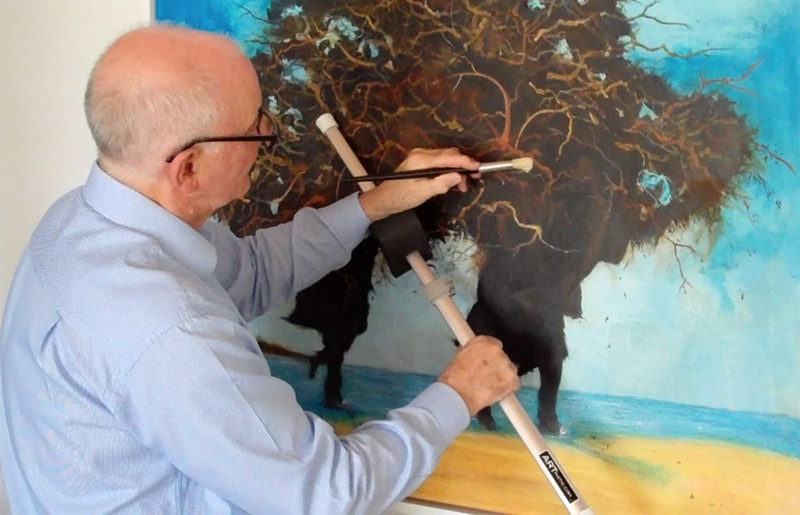 Demonstrating just one way to use an Artristic mahl stick to protect your work while painting in comfort. noun. a light stick with a padded leather ball at one end, held against work by a painter or signwriter to support and steady the brush hand. This video, narrated by Founder and leader of our Artristic Design team Tony Barber, describes the process followed in completely redesigning the mahl stick for modern painters. These are pictures of artists from several centuries ago, holding a mahl stick. It’s used to steady the brush hand, and to stop it from falling onto the surface of the canvas. But once again, just like the easel, it was designed in a time when artists’ physical and mental wellbeing was not a high priority. I don’t see any sign of heating or air-conditioning in these images. So, after talking to many living and breathing artists of all ages, I had a stab at redesigning it. And those artists told me, they now wanted a mahl stick that was: lightweight, strong, and easily cleaned; had four wide, flat edges; that would be more comfortable to rest the palm of their brush hand on. They wanted their mahl stick to be in one piece so they didn’t have to worry about misplacing, or losing any parts, and they wanted to be able to store or transport it easily. They wanted to option of being able to adjust its length and to quickly lock it in any position. Painting straight edges with it would also be useful they said, and if it could store a paintbrush or two, even better. They liked my suggestion of adding a foam pad – sliding, self-locking, adjustable shelf – that they could rest their hand on because this would eliminate any danger of their brush hand slipping down the stick. And it would increase their physical comfort, meaning they would be able to concentrate on producing their best work. When having a completely painted, but still-wet canvas, they often wanted to add little touches here and there, so I made sure they could rest the larger, “bottom end” of the mahl stick onto their stomach, or lock it under their arm, and hold it away from the canvas, but still be able to rest their brush hand on the shelf so they could paint without smudging the surface of the canvas. So there you have it – my version of the traditional mahl stick. But I like to call it the Artristic stick. I know it looks different, but sometimes, it’s those small differences that can make a big difference to someone’s art – yours, and mine. And sometimes it’s a good feeling to be part of starting a new tradition. Come on – live dangerously. Give it a try. Tony is constantly innovating, and with Creative Advisor, Carl Surges has continued to refine and improve the hand-bridge or “shelf” on our mahl stick since this video was recorded. The latest version of the Artristic mahl stick is even more comfortable and “artist friendly” to use. How long is a mahl stick? Traditionally, a wooden mahl stick is around a metre long and the need to ensure it will remain rigid under the pressure of the artist’s hand means that weight may become a factor. Our mahl stick is lightweight and fully adjustable. This means you can choose your ideal mahl stick length (between 45 and 69 centimetres) and easily lock it into place. For larger paintings you can also rest the “Artristic stick” against your torso or hold it under your arm, allowing you to work without having to place the stick, or your hand, across your work. The total redesign of the “Artristic stick” has made it the perfect mahl stick for signwriters and others in need of a versatile and easily adjustable hand rest for many other high-detail applications, including illuminated lettering, calligraphy or drawing.